Nuri al-Maliki and the Iraqi President, Jalal Talibani. Obama was almost setting the the backyard of Baghdad when he visited Turkey, so it was definitely not out of the way, and to tell the truth, when First Lady Michelle decided to go back home before Barack, I had an indication that he might just do that. There was lots of speculation, but no proof. The White House kept the travel plans secret, mainly for security reasons. It is unknown if anyone in the military even knew that he was coming, but again, you can speculate that the Iraqi President and the U.S. commanders knew of his plans when leaving Turkey. The last thing President Obama was scheduled to do was to jointly address the Turkish parliament and hold a news conference with the Turkish President Abdullah Gul. 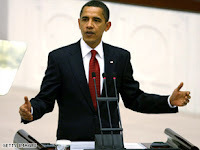 You can listen to the address to the Turkish parliament in a prior article here on this Obama website. It was an extremely busy week, as he successfully detoured all eyes and ears away form the U.S. economic crisis by traveling to Europe, as he first attended a series of summits within the G-20 summit in London. At that meeting he did discuss the global financial crisis facing all nations today. His objectives to travel to Europe were multi-faceted. Besides the G-20 conference in Great Brittain, President Obama traveled to France and Germany, and did get the allies to pledge about 5,000 troops, in the form of police and security trainers, and not as combat troops. In Prague, Czech Republic, Obama delivered a speech about nuclear nonproliferation while at least 20,000 people attended. During the speech, he brought back to life a now old slogan "YES WE CAN" as he answered critics who think he can't follow through on ridding the world of nuclear weapons. At least 79% of the people polled by CNN now believe that President Obama has a "more positive" effect on how people in other countries view the U.S. So in summation, it can be viewed that President Obama had a very successful trip to Europe and beyond. Critics, who previously thought that President Obama just didn't have the expertise in handling foreign affairs, has become a model for his Secretary of State, Hillary Clinton. Both Barack and Hillary in tandem appear to have the global situation at hand.